Bangkok—Water-spraying elephants, raves and boisterous, street-blocking water fights—Thailand’s Buddhist new year arrived with a splash Saturday, a once calm festival now celebrated with a more raucous edge. Paying respects to elders and sprinkling water over figures of Buddha at local temples are some of the traditions of the three-day new year celebration—known as Songkran—but the holiday also has a rowdier side involving alcohol-fueled revelry among its youth. 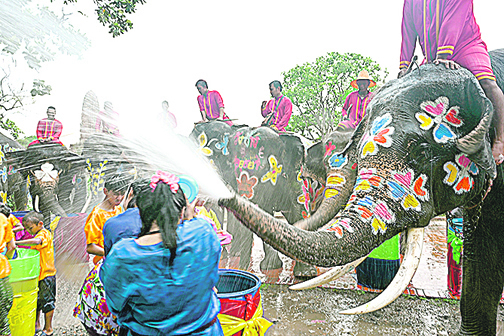 And in Ayutthaya, elephants painted in colorful floral designs lift their trunks and spray water on delighted tourists, with the town’s ancient temples serving as a backdrop. Some of the world’s best known—and paid—DJs, including Tiesto, Steve Aoki and UK veteran Fatboy Slim are performing across the three-day dance music event—Asia’s largest.